Skeletal muscle differentiation is a highly dynamic process, which particularly relies on nuclear positioning. Here, we describe a method to track nuclei movements by live cell imaging during myoblast differentiation and myotube formation and to perform a quantitative characterization of nuclei dynamics by extracting information from automatic tracking. Nuclear positioning within cells is important for multiple cellular processes in development and regeneration. The most intriguing example of nuclear positioning occurs during skeletal muscle differentiation. Muscle fibers (myofibers) are multinucleated cells formed by the fusion of muscle precursor cells (myoblasts) derived from muscle stem cells (satellite cells) that undergo proliferation and differentiation. Correct nuclear positioning within myofibers is required for the proper muscle regeneration and function. The common procedure to assess myoblast differentiation and myofiber formation relies on fixed cells analyzed by immunofluorescence, which impedes the study of nuclear movement and cell behavior over time. Here, we describe a method for the analysis of myoblast differentiation and myofiber formation by live cell imaging. We provide a software for automated nuclear tracking to obtain a high-throughput quantitative characterization of nuclear dynamics and myoblast behavior (i.e., the trajectory) during differentiation and fusion. Skeletal muscle is the largest tissue in the human body, totaling 35%-40% of body mass1. Satellite cells are muscle stem cells, anatomically characterized by their position (juxtaposed to the plasma membrane, underneath the basal lamina of muscle fibers), that give rise to proliferating myoblasts (myogenic progenitor cells), which eventually differentiate and integrate into existing myofibers and/or fuse to form new myofibers2,3,4. Their discovery and the progress in the study of their biology has led to significant insights into muscle development and regeneration. 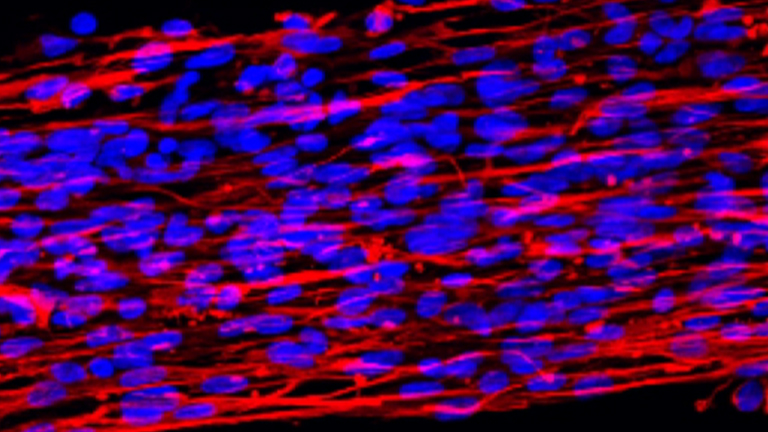 Protocols to isolate and differentiate myoblasts into myotubes have been developed many years ago and are still widely used to study skeletal muscle differentiation5,6,7. However, most of these methods represent static procedures that rely on the analysis of fixed cells and, consequently, do not allow scientists to fully explore highly dynamic processes, such as myoblast fusion and myofiber maturation. The most striking example is nuclear positioning, which is tightly regulated, with nuclei initially in the center of the myofiber and, then, located at the periphery after myofiber maturation8,9. Live imaging is the most appropriate technique to obtain further insights into such a peculiar phenomenon. Here, we describe a method that enables scientists to record myoblast differentiation and myotube formation by time-lapse microscopy and to perform quantitative analyses from the automatic tracking of myoblast nuclei. This method provides a high-throughput quantitative characterization of nuclear dynamics and myoblast behavior during differentiation and fusion. The protocol is divided into four different parts, namely (1) the collection of muscles from the hindlimbs of mice, (2) the isolation of primary myoblasts that consists in mechanical and enzymatic digestion, (3) myoblast proliferation and differentiation, and (4) live imaging to track nuclei within the first 16 h of myoblast differentiation. In the following procedure, myoblasts are isolated from H2B-GFP mice and treated with 1 µg/mL of doxycycline to induce H2B-GFP expression, as previously described10. Alternatively, it is possible to isolate the myoblasts from other transgenic mice that express a fluorescent protein in the nucleus or to transfect the cells isolated from wild-type mice to express a fluorescent protein in the nucleus, as described by Pimentel et al.9. All procedures involving animal subjects were approved by the San Raffaele Institutional Animal Care and Use Committee. Sterilize tweezers and scissors (both straight and curved) by autoclaving. Prepare and filter (0.22 µm) all the media (blocking medium, digestion medium, proliferating medium, and differentiating medium) before starting the experiment (see Table of Materials). Put 5 mL of phosphate-buffered saline (PBS) in a 35 mm Petri dish for muscle collection. Sacrifice the mouse by cervical dislocation or by using CO2 and sterilize the skin with ethanol. Remove the skin from the hindlimbs and upper limbs by using scissors and tweezers, to facilitate the isolation of muscles. NOTE: Muscles can be isolated from neonatal or adult mice. Neonatal mice have an increased number of satellite cells compared to adult mice. However, the total number of satellite cells that can be isolated from a single adult mouse is sufficient to perform the experiment described below. Isolate tibialis, soleus, extensor digitorum longus (EDL), gastrocnemius, quadriceps, and triceps, and put them in the Petri dish containing PBS. Leave the dish on ice. Carefully remove tendons and fat with sterilized scissors and tweezers. NOTE: All the procedures for cell culture are done in sterile conditions. Remove the muscles from the PBS. Cut and mince the muscles, by using sterile curved scissors, until a uniform mass is obtained. Put the muscle pieces into a 50 mL tube. Add 10 mL of the digestion medium to the muscle pieces and incubate at 37 °C for 30 min under strong agitation (250 min-1) in a water bath, to enzymatically digest the muscles. Add 10 mL of Dulbecco’s modified Eagle’s medium (DMEM) containing 10% fetal bovine serum (FBS), 1% glutamine, 1% penicillin/streptomycin, and 1% gentamicin (blocking medium) to stop the digestion. Centrifuge at 40 x g for 5 min and collect the supernatant in a 50 mL tube. Save the pellet on ice. NOTE: After the centrifugation, the supernatant contains some satellite cells, blood cells, endothelial cells, and fibroblasts, while the pellet contains pieces of undigested muscle and connective tissue. To increase the number of isolated cells, the pellet must be subjected to additional steps of digestion as described below. Centrifuge the supernatant at 650 x g for 5 min. Discard the supernatant and resuspend the pellet in 1 mL of DMEM containing 10% FBS. Keep the resuspended pellet on ice. Repeat steps 2.2–2.5 2x for the rest of the pellet obtained in step 2.4 and add the subsequently resuspended pellets to the first resuspended pellet conserved on ice. Pass the resuspended pellets through a 70 µm filter and then through a 40 µm filter. Add 15 mL of DMEM with 10% FBS, and centrifuge at 650 x g for 5 min. Resuspend the cell pellet in 3 mL of red blood cell lysis buffer to deplete the red blood cells. Incubate it for 5 min at room temperature. Add 40 mL of PBS to stop the lysis of the red blood cells, and centrifuge at 650 x g for 5 min. Remove the supernatant and resuspend the pellet in 5 mL of DMEM with 10% FBS. As preplating step, plate the cells in 20 mL of proliferation medium in a 150 mm uncoated Petri dish. After 1 h of incubation in a cell culture incubator (37 °C, 5% CO2), collect the medium. NOTE: Fibroblasts, attaching to the plate, are then discarded, while satellite cells remain in suspension. Repeat step 2.9 3x and, at the last preplating step, collect the medium which contains the satellite cells in suspension. Centrifuge at 650 x g for 5 min. While the cells are centrifuging, coat two 150 mm Petri dishes with collagen (10 mL of a 0.1% solution in 0.1 M acetic acid). To do so, put the collagen on the plate, incubate for 5 min, and remove it. Let the plate dry for 30 min. Discard the supernatant obtained in step 2.11 and resuspend the cell pellet in 40 mL of proliferation medium (Table of Materials). Plate the cells on two collagen-coated 150 mm Petri dishes (20 mL per dish) and keep the cells in a cell culture incubator (37 °C, 5% CO2, 5% O2) in proliferation medium for 2–3 days with 1 µg/mL of doxycycline to induce H2B-GFP expression. NOTE: This step allows the proliferation of myoblasts to obtain a higher number of cells for further assays. Cell density is maintained very low to avoid a spontaneous differentiation of myoblasts into myotubes. NOTE: When myoblast density is high, some cells initiate elongation, and then, it is necessary to split the cells. Generally, it is possible to split cells 2x–3x without affecting their phenotype. Discard the medium, wash the cells with 5 mL of PBS, add 2 mL of trypsin (1x), and incubate the plate at 37 °C in a cell incubator for 5 min. Check under the microscope and, when round cells detach, add 5 mL of DMEM with 10% FBS to inactivate the trypsin. Count the number of cells (usually it is possible to obtain about 1 x 106 cells/mouse). NOTE: Incubation with trypsin for 5 min is usually enough to detach the proliferating myoblasts. Subject the cells to one of the assays described below. Plate 50,000 cells/well in 1 mL/well of proliferation medium in a collagen-coated 12-well plate and incubate the plated cells in a cell culture incubator (37 °C, 5% CO2). Fix and count the cells at 24, 48, or 72 h.
NOTE: The medium is replaced every 48 h to avoid nutrient exhaustion. Coat a 12-well plate with 350 µL of differentiation medium containing basement membrane matrix (1:100). Incubate the plate at 37 °C for 30 min and remove the medium. Plate 200,000 cells/well in the differentiation medium in the matrix-coated plate. Incubate the cells in a cell culture incubator (37 °C, 5% CO2, 5% O2) until they adhere to the plate (2 h are generally enough for the cells to adhere and to start differentiation). To assess differentiation, perform staining for myosin heavy chain and nuclei as previously described11. Alternatively, perform live-imaging analyses as described below. For live cell imaging, put the cells, obtained in section 3.2.2 and plated in a 12-well plate, under a confocal microscope, equipped with an incubation system to maintain the cells at 37 °C in 5% CO2. 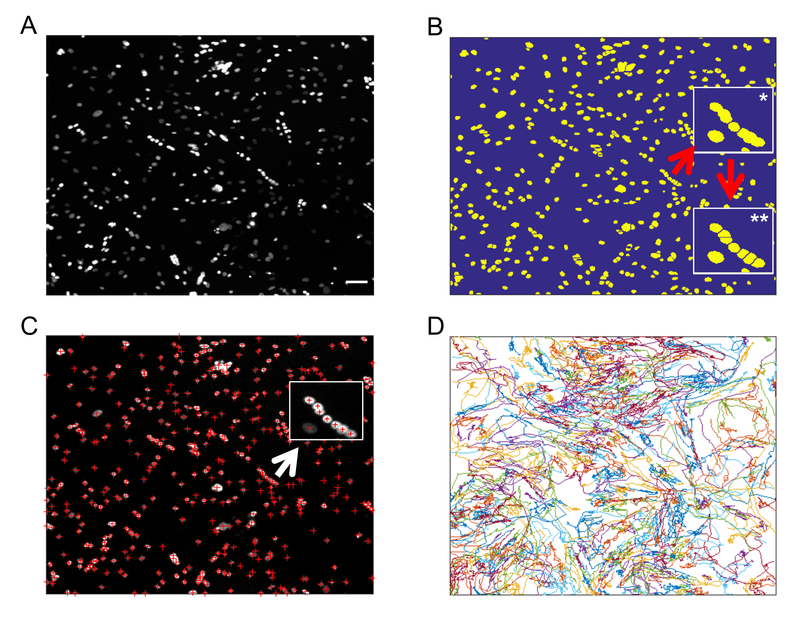 Use a 20x dry objective (0.7 NA) to get fields of view with hundreds of cells, enough to monitor myofiber formation. H2B-GFP cells can be imaged with a low-intensity 488 nm Argon laser. NOTE: An open pinhole ensures that the image depth (~10 µm) contains the cell thickness so that cells are kept in focus throughout the experiment. Using a confocal microscope is advantageous since it improves the signal-to-noise ratio of the images, although wide-field microscopy could also be used. Myofiber formation can be monitored through the transmission channel. Acquire images of 16-bit and 1,024 x 1,024 pixels per frame every 6 min for 16 h. For each acquired position, generate a multiframe.tif file (see example in the Supplementary Files). NOTE: In the present protocol, commercial software associated with the microscope (Table of Materials) has been used; use the appropriate software to achieve the same goal when using other microscopes. Download the software provided as a .zip supplementary file. NOTE: The routines are scripts that must be run in MATLAB. The software is an adaptation of a published software12 optimized for the tracking of the nuclei during myotube formation. This software is divided into two parts: the first one identifies the nuclei in each frame by segmenting them, while the second one generates “tracks” (trajectories) of nuclei movement. The complete code for nuclear segmentation and tracking and a step-by-step guide to getting started are provided in the Supplementary Files. Extract the zip file and save it in a desired path on the personal computer (PC) in use. Perform all the below passages on a PC with the necessary software already installed. Note that the .zip file is composed of three folders as mentioned below. NOTE: Segmentation Routines contains the functions to be run for the segmentation. Tracking Routines, instead, contains the functions required for the tracking. Example Segmentation Tracking provides the basic scripts and files to get acquainted with the system. The software used for segmentation and tracking of the nuclei runs properly in MATLAB, R2015a or later versions. To segment the nuclei from the .tif file, name the file, for example, NameFile.tif. Open the Example Segmentation Tracking folder and click on DoSegmentation.m. This will open the command window in MATLAB. Check the Current Folder window on the left to see all the elements in the Example of Segmentation Tracking folder. Double-click on DoSegmentation.m. NOTE: Detailed information on the modifications that have to be done in the script can be found in the StepbyStep.txt file. It is mandatory to modify the script so that the variable filenameinput is NameFile.tif and folderinput is the folder where the .tif file is contained. Run the script (by clicking on the green Run button). The result of the segmentation will be saved as a file.mat (SegmentedNameFile.mat), while the segmentation of the nuclei can be visualized in the output figure. NOTE: Parameters for the segmentation, described in the script, can be modified if needed. The quality of the segmentation can be checked using the script CheckSegmentation.m (see the StepbyStep.txt file). Based on this, if the quality of the segmentation is poor (only a few nuclei detected), adjust the parameters of the segmentation, clearly indicated in the DoSegmentation.m script, and repeat the procedure. To generate the tracks (i.e., the trajectories of each of the nuclei in time), using the nuclear positions obtained in the segmentation, run the script GenerateTracks.m in the same working folder. Be sure to add the proper segmentation file as an input, obtained before (see the StepbyStep.txt file for further information). NOTE: As an output, the user will obtain a file TrackedNameFile.mat, with a matrix for the x-coordinates and another matrix for the y-coordinates of the generated tracks. Evaluate the quality of the tracks using CheckTracking.m (see the StepbyStep.txt file for further information). Use the output figure of this last passage to help visualize each nuclei position in time. Check on the left for green crosses that indicate each segmented nucleus. To select one specific nucleus, use the lower scrollbar. Note that the selected nucleus will be circled in red, while on the right, the trajectory of the selected cell can be followed in time (by using the upper scrollbar). To automatically follow nuclear movement during myoblast differentiation in live imaging, the nuclei should preferentially be fluorescently labeled. It is important to note that using DNA-intercalating molecules is not feasible because these molecules interfere with the proliferation and differentiation of primary myoblasts13. 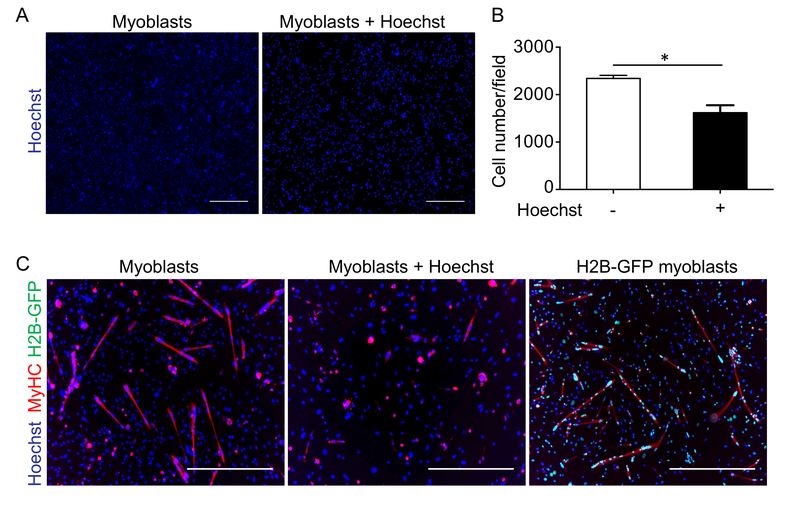 As an example, proliferation and differentiation have been analyzed in primary myoblasts cultured with or without Hoechst (Figure 1). It is evident that proliferation (Figure 1A, B) and differentiation (Figure 1C, middle panel) are strongly impaired in myoblasts cultured with Hoechst 33342. Conversely, myoblasts isolated from H2B-GFP mice and cultured with doxycycline have nuclei with green fluorescence and differentiate similarly to myoblasts isolated from wild-type mice (Figure 1C, right and left panels, respectively). Live cell imaging with primary myoblasts expressing the H2B-GFP protein allows the tracking of nuclei during differentiation (Figure 2 and Supplementary Video 1). Merged images of transmission and GFP channels at the initial (Figure 2A) and final time points (Figure 2B) during the differentiation of H2B-GFP myoblasts allow scientists to identify myotubes and, consequently, nuclei that end up integrating into a myotube (e.g., the nucleus in the blue circle) or nuclei that do not fuse into a myotube (e.g., the nucleus in the red circle). To extract information on nuclei/cell movements from the live cell imaging data, it is possible to use the provided software to track the trajectories of the nuclei. The software uses the image from the H2B-GFP channel (the nuclei; Figure 3A) to create a mask and to segment the nuclei in each frame. For nuclear segmentation in a frame, a "conservative" threshold is selected using Otsu's method on the image after Gaussian filtering14. Next, objects are roughly segmented; to get a finer segmentation, each object is masked again using a threshold based on the average in its bounding box. A watershed transform is then used to separate nearby objects (Figure 3B). In our hands, one watershed transform has been unable to separate most nearby nuclei (Figure 3B, *inset). Thus, we used the area to select the larger objects in the image and apply a new watershed transformation (Figure 3B, **inset), which is able to separate additional nearby nuclei. With this approach, most of the nuclei are identified in the image (Figure 3C). To track the nuclei, we improved the routines by incorporating the tracking routines published by Tinevez15. In short, the tracking algorithm links nuclei detected in consecutive frames with the aim of minimizing the sum of the distances between the position of each nucleus in a frame and the position of the same nucleus in the next one, using the "Hungarian algorithm" for such minimization16. The step is repeated in order to link unlinked nuclei that are up to a certain maximum number of frames away. A threshold for the maximum distance between the position of an object in a frame and the next one is also established. For the data presented here, a maximum number of five frames and a maximum distance of 20 pixels per step give a high number of correct tracks (Figure 3D). Importantly, we can use these routines to check the quality of the tracking. It is also possible to use this script to find cells that have a given behavior, for example forming (or not) a myofiber, and subsequently analyze the dynamical features of the set of cells of interest. The applied software generates the tracks with the x- and y-coordinates for each cell in frame n, , for hundreds of cells (Figure 3D). We can use such information to extract information about nuclei motion. As an example, the total displacement between the initial frame (n = 0) and the final frame N is defined as follows. Here, "||·||" stands for the norm of the vector (Figure 4A). The velocity of each nucleus in frame n is as follows. Then, we can define the length of a trajectory for a given cell as follows. As an example of how these simple parameters can already give relevant information, we computed the length of nuclei trajectories of myoblasts incubated with or without Hoechst. It appears that the total length of the trajectories is slightly higher for cells stained with Hoechst, although the difference is not significant (Figure 4B). However, when we computed the total displacement during a time lapse, we observed that the total displacement of cells stained with Hoechst was significantly smaller than that of unstained cells (Figure 4C). This indicates that the movement of stained cells has a lower directionality. 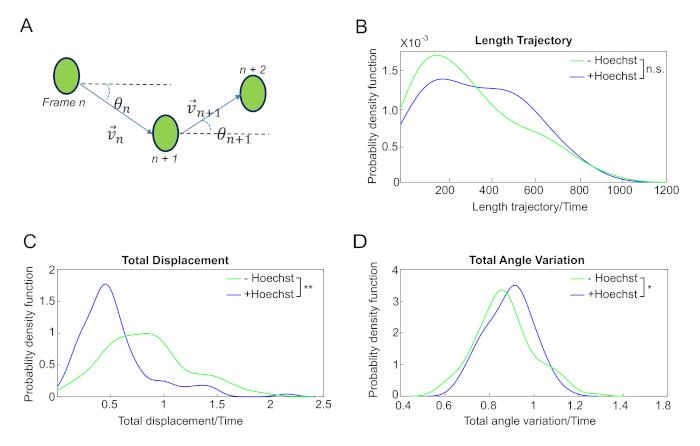 To further strengthen this hypothesis, we quantified the directionality of the motion of a cell by computing the angle of the velocity in each frame (Figure 4A). We also quantified the variation of the angle between frames. The total angle variation along a trajectory can then be defined as follows. As predicted, the total angle variation for the unstained cells is significantly smaller compared to cells stained with Hoechst (Figure 4D). Hence, this simple measure of directionality, obtained from a straightforward calculation, indicates that the myoblasts stained with Hoechst are less prone to maintain the direction of their displacement, which reflects their impaired ability in forming myotubes (Figure 1). In short, live cell imaging data generated as described here provide a quantitative link between nuclear dynamics and the ability to form myotubes and can be used as input for a high-throughput quantitative characterization of nuclear dynamics and myoblast behavior during differentiation and fusion. Figure 1: Incubation with Hoechst interferes with the proliferation and differentiation of myoblasts. (A) Representative images of primary myoblasts stained with Hoechst after 24 h in proliferation medium (left panel) or cultured for 24 h in proliferation medium with Hoechst (right panel), and (B) the relative quantification. Data are the mean ± SEM, and the statistical significance was assessed with Student's t-test. *P < 0.05. (C) Representative images of primary wild-type myoblasts, cultured for 24 h in differentiating medium without (left panel) or with Hoechst (middle panel), and of H2B-GFP myoblasts cultured for 24 h in differentiating medium (right panel) and stained with Hoechst (blue) and an anti-myosin heavy chain antibody (MyHC; red). The scale bars = 500 µm. Please click here to view a larger version of this figure. Figure 2: Live imaging of H2B-GFP myoblasts during differentiation. Merged images of transmission and GFP channels at (A) the initial (t = 0 h) and (B) final time points (t = 16 h) during the differentiation of H2B-GFP myoblasts (20x objective). Some examples of myotubes are highlighted with black arrows in panel B. The scale bars = 50 µm. (C) Magnified dotted areas from panels A and B in which it is possible to identify a single nucleus that ends up integrating into a myotube (in blue) or not (in red) at t = 0 h, t = 8 h, and t = 16 h. The scale bars = 50 µm. Please click here to view a larger version of this figure. Figure 3: Segmentation of H2B-GFP myoblasts tracking during differentiation. (A) Example of a frame of the time lapses showing the nuclei of approximately 400 cells. (B) Example of nuclei masking and segmentation. Bright objects are segmented using both a global and a local threshold, and a watershed transformation is applied to separate nearby nuclei. Nearby nuclei might be difficult to segment (*inset), so a second watershed-based segmentation is performed in objects of large areas to segment a higher number of nuclei (**inset). (C) Detected nuclear positions (red crosses), that are later used in the tracking algorithm. (D) Tracks generated using the tracking algorithm that minimizes the sum of the distances between each object's position in two consecutive frames. A maximum possible value of such distance for each object is provided as an input that allows scientists to link nuclei separated by more than one frame. The scale bars = 50 µm. Please click here to view a larger version of this figure. Figure 4: Quantitative analyses of nuclei dynamics uncover the impaired ability of myoblasts incubated with Hoechst to maintain cell directionality. (A) Description of parameter measurements.It is possible to define the velocity of a nucleus by considering the position in two consecutive frames. The trajectory angle and the angle variation can then be readily calculated from the positions as indicated in the scheme. 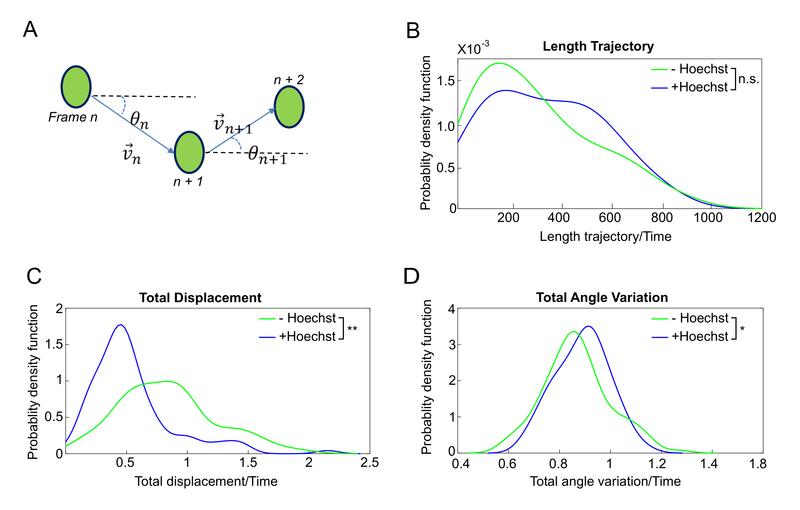 (B) Distribution of the trajectories length, (C) total displacement, and (D) variation of the trajectories angle of myoblasts incubated without Hoechst (green line) or with Hoechst (blue line). The two distributions are not significantly different, while the total displacement is significantly higher, and the variation of the angle is significantly lower for unstained cells (one-sided Kolmogorov-Smirnov test, *p < 0.05 and **p < 0.005). Please click here to view a larger version of this figure. Supplementary Video 1: Live imaging of H2B-GFP myoblasts during differentiation. Imaging of H2B-GFP myoblasts cultured in differentiating medium from the initial (t = 0 h) to final time points (t = 16 h) using transmission and GFP channels (20x objective). Please click here to download this file. Muscle fibers (myofibers) are multinucleated cells that are formed by the fusion of muscle precursors cells (myoblasts) derived from muscle stem cells (satellite cells) that undergo proliferation and differentiation2,3,4. To assess myoblast differentiation, the common procedure consists of culturing myoblasts in differentiating medium and fixing the cells at different time points to perform immunofluorescence staining for MyHC, a marker of differentiation, and staining of nuclei with DNA-intercalating molecules (e.g., Hoechst)5. This method is useful to evaluate myoblast differentiation by measuring different parameters, such as the differentiation index (number of MyHC-positive cells/total cell number) or the fusion index (number of myotubes with at least two nuclei/total cell number). However, myoblast fusion and myotube formation are highly dynamic processes that rely on the motility of the nuclei8. Indeed, nuclear positioning within myofibers is required for proper muscle regeneration and function17. The mobility of myoblasts and of their nuclei might turn out to be a critical parameter to evaluate myoblast differentiation and to uncover novel defects in muscular disorders. Hence, it is essential to develop novel procedures to study cell behavior and nuclear movement during myoblast differentiation and myofiber formation. Here, we describe a method that enables scientists to follow myoblast differentiation and myotube formation by live cell imaging and to perform quantitative analyses from the automatic tracking of nuclei. 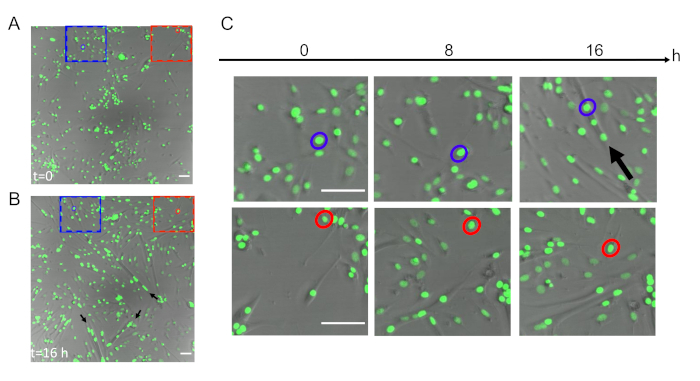 The advantage of this method is the possibility to track during the differentiation of fluorescent nuclei of myoblasts, isolated from H2B-GFP mice, without any cell transfection or additional staining. The H2B-GFP mice are commercially available and, consequently, easily accessible. Alternatively, it is possible to isolate the myoblasts from other transgenic mice that express a fluorescent protein in the nucleus or to transfect the cells isolated from wild-type mice to express a fluorescent protein in the nucleus, as previously described9. These different options further extend the potential applications of the method presented here. The current protocol relies on the culture of primary myoblasts, and consequently, a high variability might be observed in the following experimental procedures, also due to the potential presence of nonmyogenic cells after the isolation from muscles18. To overcome this limitation, it is possible to isolate myoblasts by cell sorting as previously described19. Another critical point in the method described here is the difficulty to generate a perfect tracking of nuclei when cells are close to each other, such as during myotube formation. However, the software routines discussed here allow scientists to visually inspect the quality of the tracking and, if necessary, to select a subset of cells of interest for a subsequent analysis. Further improvement of the software might be required to provide a complete characterization of nuclear dynamics during myofiber formation. In conclusion, this method is useful to provide quantitative insight into nuclei dynamics during myoblast differentiation by comparing different conditions, as we reported with Hoechst incubation. This example illustrates the ability to extract meaningful dynamic data from time-lapse experiments. This work was supported by the AFM-Telethon to E.V. (#21545) and by the Ospedale San Raffaele (OSR) Seed Grant to S.Z. (ZAMBRA5X1000). Dr. Jean-Yves Tinevez from the Image Analysis Hub of the Institut Pasteur is acknowledged for publicly sharing his "Simple Tracker" MATLAB routines.